E Ink Holdings (EIH) reported its financial results for Q3 2017, with revenues of $158.8 million (up 7.8% from Q3 2016 and 29.8% from Q2 2017) and a net profit of of $38.8 million. E Ink says that these excellent results were due to a sharp increase in e-reader and e-paper notebook sales and improvements in operation efficiency and production yields. E-reader and notebook sales accounted for 70% of EIH's revenues. Digitimes posted an interview with E Ink Holdings' chairman & CEO, Frank Ko. Frank joined EIH in 2013 and became the CEO in June 2014, when he began to transform the company as it suffered losses following the e-reader market decline. Frank discusses the changes he had to perform at E Ink, the direction the company is now taking and the next goals of the company. The Vienna Airport line shuttle installed outdoor E Ink signage in its stations in Vienna to show real-time passenger information to guide travelers to the airport. The project includes signage for all the shuttle bus stations (over 25). The two main stations use a large double-sided 32" 2560 x 1440 E Ink displays (shown below), while the rest of the stations show a 15" E Ink display (shown above). 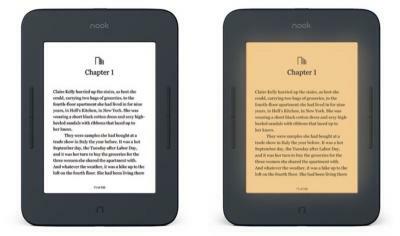 Barnes and Noble's Nook GlowLight 3 is an E Ink powered e-reader that supports an advanced front lighting system that can switch from a daylight "cool" white light to a warm "yellowish" one suitable for nighttime. The display is a 6" 300 DPI E Ink panel. The GlowLight 3 is now ready for pre-order for $119.99.